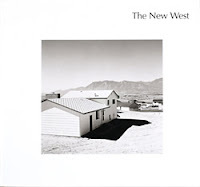 I found an old copy of Robert Adams The New West at the U of O library this week. It was published in 1974 and is now out of print and costs several hundred dollars and so a library is the only way to see it. I'd seen some of the pictures before, including several original prints at a Reed College show a few years back, but never studied the book as an integral subject. Photobooks are sort of like music albums. Listening to an original album is a much different experience than listening to the same songs in a different context, like on the radio or (ug!) on a greatest hits collection. In the same way, to get a sense of how the photos were edited and contemplated in their original context it helps to see the photo book. Anyway, The New West is the book that put Adams on the map. The photos are of Denver's soulless suburbs. Prefaced with a (more anti-development than pro-photography) Szarkowski essay the book took a clear shot at Western Sunbelt sprawl. Yeah, I know that point of view is so commonplace today it's almost thoughtless but back then it was original, especially for a photographer. Landscape photographers were supposed to shoot waterfalls. The other Adams, that was the standard. Robert Adams? A voice from the fringe. What I like about the book, and about Adams photos in general, is that they aren't exotic. In fact they seem to be the exact opposite of exotic. He just goes around where he lives (now Astoria, in the northern tip of Kyrgyzstan) and documents it. He often shoots mid-day and includes telephone wires, boring signs, etc, stuff that most professional photographers would exclude. The viewpoints seem haphazard at times, like he could've moved 5 feet either way and gotten just as much meaning in the shot. I used to hate those types of photos, and I used to hate Adams photos. I couldn't understand what the fuss was about. His photos seemed too nonspecific. They weren't especially well timed or placed, and since I thought a photo was a guy jumping over a puddle in Paris I didn't get them. And I think that's the other thing I like about his photos, that my attitude toward them has shifted. My mind has had to open a bit.